Two weeks back, we reported on the doomsday predictions of local rail advocacy group All Aboard Ohio: “Cleveland Rail Shutdown Unavoidable,” wrote the group’s Executive Director Ken Prendergast in a post which suggested that RTA wouldn’t have the funds to maintain its Blue/Green Line fleet in as few as five years. At the time, RTA CEO Joe Calabrese called those predictions “absolutely false,” and told Scene — what else — that RTA had no plans to abandon either the Blue or Green lines, 100-year-old community assets. RTA said that it was “exploring” whether or not a single rail car fleet could replace what is now two different and non-interchangeable fleets (Red and Blue/Green). If that were the case, the current 108 rail cars could be replaced by approximately 70. Calabrese has now come out and said that, yes, he wants to raise $280 million to finance 70 rail cars at $4 million a pop. 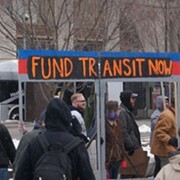 And the money that RTA is putting aside every year won’t come close to covering the cost. Calabrese said he’ll look to the state of Ohio and the Federal Government to help finance a new fleet, but one wonders what in the world makes him think Governor John Kasich will suddenly about-face and decide that public transit is a worthwhile investment. In a 2014 study, the Ohio Department of Transportation found that the average state supports 20 percent of the cost of transit, while Ohio supports only one percent. One percent! 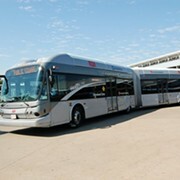 The study recommended that Ohio increase its transit funding to 10 percent by 2015. And while Kasich proposed a modest increase in the current budget, that increase was not contained in the final budget bill. (FYI: Opportunity Corridor Price tag = $331 million). Meanwhile, Prendergast reminded ideastream that every winter, the aging rail fleet reveals itself as a fleet in need of repair and replacement. “And that need is only going to grow more acute as time goes on,” he said.